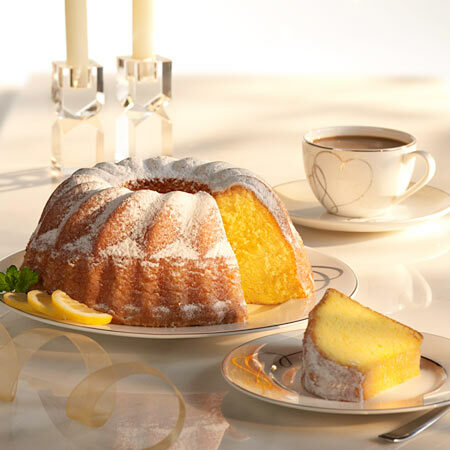 Lemon LuLu cake is an inspired lemon pound cake - light, moist and lemony, but not too sweet - covered with a delicate fresh lemon glaze. Wonderful by itself or with your favorite toppings such as fruit, ice cream or sorbet, it makes an elegant party dessert. Keep one in the freezer for unexpected company. Important shipping Information: To assure freshness on arrival, LuLus are delivered on Wednesday, Thursday, or Friday only. Please select 2 day service for shipments to Florida and west of the Mississippi. Lemon Lulus have become somewhat of a legend in our home. We have had them shipped, we have driven from New York to Vermont for them, we have made relatives load their trunks up with them, all because a holiday isn't complete without one. Simply delicious! Tender, moist, soooo lemony but not too tart (how do they do that). I am a sugarholic and yet I would never add ice cream, whipped cream, or anything else to this delightful confection. It is perfect just as it is! I can't properly express just how amazing this company is to anyone reading this post. Genuine, innovative, hard working and kind owners who happen to have created the World's Greatest Cake. They should be a 6 Star Rated Company as simply rating them a 5 Star Company isn't justified. Their Lemon LuLu cake is a party in your mouth. Dealing with the company who puts the customer first also makes it easy to buy from them. I could go on and on but I encourage you, if you haven't yet purchased a Lemon LuLu to buy one today. You'll not only love it but you'll be a life long fan. It's so good that if there was a Dessert Hall of Fame it would be the first inductee in my book. Enjoy everyone! I love this cake. It was my grandmothers favorite cake and she would have it everytime we came over. She past away last April, so everytime I think of her, I think of Lemon Lulu! My dad sent me one and now I'm sharing it with all my coworkers since they have never heard of it. Thank you so much!! I received this cake for Mother's Day, and decided to freeze it per the instructions; 3 months later, we enjoyed it at a family gathering, it was absolutely delicious! "I think this is the best cake I have ever had!" We sent this cake to my daughter for her 17th birthday. She declared, "I think this is the best cake I have ever had!" Maybe we will need to make this gift an annual tradition on her birthday! I've never ordered a lemon cake (or any cake) on-line, but after such a good experience with the buttercrunch I just had to try. I live local to Mother M's and the package arrived super quick. It was just as fresh as the buttercrunch. Moist inside with a beautiful lemon flavor, icing+powdered sugar over the top and properly and carefully packaged! A real treat. Thank you for meeting and surpassing my hopes for this product. Dec 31, 2010 | By Marj G.. I RECEIVED THE LULU LEMON CAKE AS A CHRISTMAS GIFT AND WAS DELIGHTED ON OPENING TO DISCOVER THE BEAUTIFUL WRAPPING - THE CAKE IS A WONDERFUL LIGHT LEMON TREAT YOU CAN ENJOY WITH A CUP OF TEA. GREAT PRESENT! I have been eating Lemon LuLus since I was a kid. I also had the cake (on a larger scale) shipped out for my wedding cake in Montana. People are still talking about it! I now use it as a thank you gift for clients. I wish the prices were still the same as they were in the '80s! This will be my wedding cake, hands down. It is so delicious and is good for breakfast, a snack, or dessert. I love it plain or with whipped cream & strawberries. It makes an amazing gift as well! Please never stop making this cake!!! The Lemon Lulu is outstanding. My sister is especially fond of your Maple Walnut fudge. She keeps the chocolate to ward off visitors and keeps the maple walnut for herself. My family received a Lemon Lulu as a X-mas gift. Needless to say that this scrumptous desert was absolutely to die for. Moist, full of flavor!! It was absolutely delicious! My family is now big fans, and considering I only live an hour away we will be planning on many many trips to Manchester to their store! After sending a lemon lulu to my son two years ago, I now get a gentle reminder that it is his favorite for the holidays. Now sending one to my other son !